As the authorized LiftMaster Garage Door Opener distributor, Ole and Lena’s Door Company proudly offers a full line of LiftMaster Garage Door Openers – the best in the business, including Belt Drive Openers, Chain Drive Openers and Jackshaft Wall-Mount Garage Door Openers. 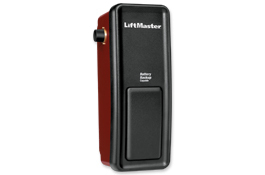 The LiftMaster 8550 3/4HP Belt Drive Garage Door Opener is our flagship model, equipped with the LiftMaster Elite Series Battery Backup System so you can quietly enter or leave your home – even during a power outage. 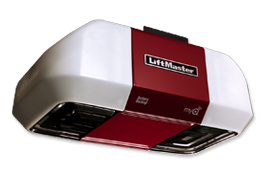 This best-in-class model also features the revolutionary LiftMaster MyQ Technology and Timer-to-Close functionality. Equipped with MyQ technology that lets you monitor and control your garage door and house lights remotely by using a computer or smartphone. The Remote Light lets you light your garage your way, wherever it’s needed. 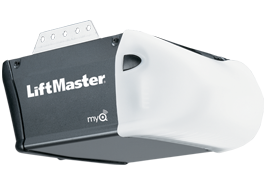 The LiftMaster 8165 1/2 HP AC Chain Drive Garage Door Opener with MyQ technology, Security+ 2.0, Electronic Limit and Auto-force. This Garage Door Opener is the ideal choice for value and reliability. Its durable 1/2 HP motor combined with an industrial-strength chain drive provide smooth, steady performance year after year. The LiftMaster WLED DC Battery Backup Belt Drive provides daylight-like light to every corner of your garage thanks to its Corner to Corner Lighting. The extra long belt drive system keeps living spaces virtually silent. Features include home connectivity, allowing you to connect to a home network with built-in WiFi and open, close, and receive alerts about your garage door through your smartphone. Ole and Lena’s Garage Doors is a Twin Cities Metro-based retailer and servicer of garage door products. We have received accreditation from the Better Business Bureau and are proud to have been given the Good Housekeeping Seal of Approval. We rely on repeat business and referrals from a network of satisfied customers, so you can trust that you’re working with a company that has been thoroughly vetted and approved by your Twin Cities neighbors. If you seek further information on garage door opener installation, feel free to contact our sales or customer service representatives during normal business hours of 8:00 am to 4:30 pm Monday through Friday by calling our number at 952-888-1110, or via the contact page. Also, for any situations requiring immediate attention, we offer EMERGENCY SERVICE 24/7/365. For our commercial clients, we carry and service an extensive line of commercial garage door openers and related accessories.